7/27: Kitchen is open to dining and living area. This property is ALL BRAND NEW. It has just been totally re-decorated with all new: living room, dining and bedroom furniture and new carpet in the bedrooms. New quilts, linens and decor. And has been freshly repainted. 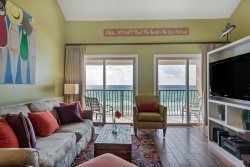 Emerald Dunes is the one of most popular family complexes in Destin’s Crystal Beach area! This condo is our second home and we invite you to use it as your own. Our 3 bedroom condo is open and airy with all NEW furniture and decor. It has a nice kitchen with granite counter tops, front-loader washer/dryer, and BEACHFRONT MASTER. It has a balcony off the living room where you can sit and enjoy your morning coffee while watching the dolphins frolicking or have an evening cocktail watching the sunset. Our condo is the perfect place for your family to use alone or to share with friends. Because we have 2 master suites, both with King-size beds, attached baths and HDTV’s, neither couple will have to sacrifice the “bigger bed.” The third bedroom is perfect for another couple or the children with a Queen bed and a single upper bunk. You will be pleasantly surprised by all the 'extras' in our home that you would not normally find in a rental unit. No need to pack up your porta-crib, high chair, or sand toys, we have them all! And of course, you will love the white sand Destin beach that is just footsteps away. The Master suite has a King size bed with AMAZING views of the water from the bed. The beds are make with Egyptian cotton sheets, 2 night stands, reading lamps, HDTV. There is also an attached dressing area which features a large, walk-in closet and a dressing area complete with a sink and mirror, which nicely optimizes bathroom time since one can be showering and the other can be getting ready—which leaves you with more time to spend on the beach! The attached full bathroom has a garden tub and a separate shower, hair dryer and large fluffy bath towels. The Master Bedroom 2 has a King size bed with Egyptian cotton sheets, 2 night stands, reading lamps, HDTV. The attached full bathroom has a tub/shower combination, hair dryer and large fluffy bath towels. Our third bedroom is a unique layout that can accommodate another couple in a Queen bed or it would be a great spot for up to 3 children. It features a regular queen bed on the bottom and a twin-size upper bunk (with a regular twin mattress). There’s also a night stand and a closet. This bedroom shares the Jack-and-Jill style bath with the 2nd master. In our main living area we have a queen-size sofa sleeper with reading lamps nearby, we also have four side chairs which all provide ample comfortable seating . We also have an HDTV with digital cable channels, a DVD player and a blue tooth docking station so you can listen to your favorite tunes on your phone. The living room opens up to our balcony via sliding glass doors. Our balcony chairs so you can sit and enjoy your morning coffee. The balcony faces the directly south so you can enjoy the morning sunrise and the evening sunset right from the balcony! Our kitchen is beautifully appointed with granite counter tops and a brand new stainless steel refrigerator. It’s also one of the best equipped you’ll ever find in a rental! We have a Keurig K-cup coffee maker, as well as a regular drip model, a blender that will grind all of your ice for frozen drinks, toaster and the other usual appliances. We have more than ample plates, glasses, forks, etc. so you don't have to wash your breakfast dishes before you eat lunch. We have plenty of pots and pans and baking pans. We also supply many “extras” such as cleaning products, trash bags, aluminum foil, plastic wrap, sugar, creamer and spices. The Dining area features a table and 6 chairs and 4 bar stools. *Centrally located on Scenic Gulf Drive in Crystal Beach (near Destin Commons and right across from Camille's Restaurant and Coffee Shop), it is very close to local attractions, restaurants, and shopping. Emerald Dunes is designated as a smoke-free, tobacco-free and e-cigarette-free environment. This includes all interior and exterior areas of the resort, including but not limited to the condos, parking lot, swimming pool area, hot tub & barbecue area.